EWB interview with Johannes Hahn, EU Commissioner for European Neighborhood Policy and Enlargement Negotiations. 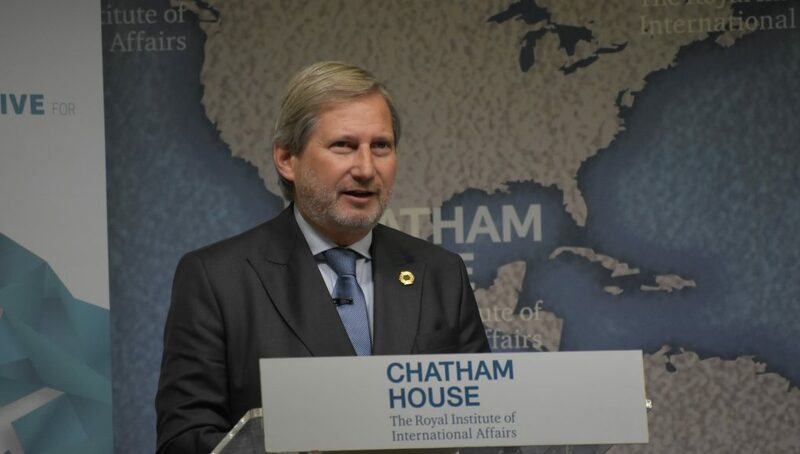 Hahn will be a keyonote speaker on the event “Beyond Berlin: What Does the Next Decade Hold for the Western Balkans?”, organized by Chatham House, European Fund for the Balkans and DG Near in London on 10 July, at the margins of the London Western Balkans Summit. European Western Balkans: How do you see the successes of the Berlin Process so far? Johannes Hahn: When in August 2014 Chancellor Merkel brought leaders to Berlin to discuss regional co-operation, the idea was – and still is – to revitalize ties between the ‘Western Balkans six’ and the EU and its member states. Much has been achieved under this process under successive chairs, including the development of a comprehensive EU-Western Balkans connectivity agenda that covers transport and energy, the economy, people to people contacts and now also digital technologies. Overall, I believe the Berlin Process has not only created a very useful framework to make progress in all these areas but has also contributed to setting a new vision for the region, based on its firm European perspective and on regional cooperation. EWB: Do you believe that the Berlin Process remains to be important after the EC Western Balkans strategy and stronger commitment of the entire EU to the region? JH: As I said, the Berlin Process set out a concrete vision for EU-Western Balkans relations, putting regional cooperation at the centre. The idea is simple: we work together, we win together. Unless our partners cooperate on a regional level and maintain good neighbourly relations, the Western Balkans cannot achieve sustainable progress on their respective European paths. This core idea will remain relevant for the years to come. EWB: What are your expectations regarding the future of the Berlin Process after London? In which ways do you think the Berlin Process can improve and adjust to the needs of the region and the EU? JH: I think the Berlin process will and should in the first place continue to encourage and mobilise leaders of the region to take more ownership of regional cooperation. The region needs to demonstrate that it is ready to take control of its destiny, to overcome a difficult past to be a part of a shared future in the EU. That’s for the countries to do, of course. But the Berlin process can provide the carrot, and the stick, if need be. EWB: Even though there were many positive signals from the EU regarding enlargement in the Western Balkans in the previous year, recent developments have shown us that certain member states do not share the EU’s enthusiasm. It was especially President Macron’s statements that made the headlines. Do you believe that the Western Balkans’ EU future remains clear? JH: It does. And the EU has been clear about it. President Macron’s statements were not against enlargement per se, they were more about the timing, or particularly the sequencing. Do we need to reform the EU before we let in new members? Commission’s own Western Balkans strategy issued in in February underlines that the EU itself needs to be ready to welcome new members. EWB: There seems to be a consensus that the rule of law is the most important area on which Western Balkans must work on if they expect to become EU member states. What do you think the EU should do to pressure or encourage the governments to undergo such reforms? JH: Whether you call it encouragement or pressure, the EU’s approach has been clear – the fundamentals first. Membership negotiations will begin with the rule of law, and the rule of law will be the last negotiating chapter that we close – and only when we know that a satisfactory level has been achieved, with solid track record of sustainable, irreversible results. In other words, progress on the rule of law will set the pace for the entire negotiating process. We will continue to offer guidance and assistance, of course, but the ball is in the court of the countries wishing to join the EU. They need to deliver on the rule of law, and not for ‘Brussels’, for their own citizens, who want to live in countries with strong, thriving democratic systems and institutions, where minority rights are respected, where individuals and businesses can count on independent judiciary to protect them, and where corruption is effectively prevented and investigated. This is what the citizens rightly deserve and expect their governments to deliver.